Here's a good example of Twitter goodwill fundraising from Lend4Health ;) Why? It's sharing great measurable results in under 140 characters, and is from a member of the Lend4Health community, rather than Tori herself. Just added this pic to the Flickr group, as an example of goodwill fundraising on Twitter. This was a campaign one of the then members (now admin) of TuDiabetes.com, led to help raise funds for the Diabetes Hands Foundation. I believe that fundraising should not just help you now, but set you up for the future in some way (brand recognition, building trust, developing networks, etc). Having recently started my first fundraising effort on Twitter for ActionAid's Project Toto (http://www.everydayhero.com.au/rodlewis), the best advice I have received and can share is who to follow on Twitter. Users such as yourself, @RositaCortez, @edwardharran, @suewaters and many others have so much experience and knowledge, and you all impart those learnings freely and openly. It's the kind of corporate knowledge and wisdom that few people coming into the fundraising field would have. So while I don't have a screen shot for you, I'll go by your original tweet that I saw, which just asked to "leave comment about your best wisdom about twitter fundraising to enter". And that wisdom is to listen to, learn from and link with the experts. The interactivity that Twitter offers truly is a university unto itself. Just added a few choice tweets from WiserEarth's OpenWiser API campaign, which was conducted entirely with social media -- primarily Twitter. For more information see our Blog post on OpenWiser and follow our Peggy Duvette, our Tweeting Executive Director @WiserEarth. You can also get get involved with the OpenWiser API Developers Group. 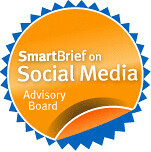 The campaign was initiated and supported by our online community. Thanks to all for sharing you insights. Not entering this round of the Kanter Great Book Giveaway - because I bought a copy of Twitterville already. My library will get it when I'm through:-). Also, still busy learning this from you and others. It does crack me up that you compare his research on Ancient Fundraising Beginnings from July 07 to sociology/paleontology! Really, how are us newbies going to catch up? Wish you where here for Gnomedex and the Voluntweetup kicking it off! 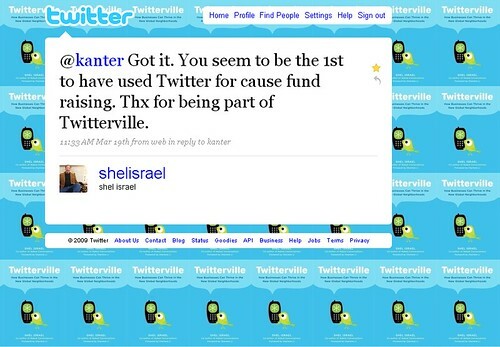 I would *very much* appreciate a copy of Twitterville and would be truly honored if @shelisrael would sign it! On another note, Kathy Gill's @uwtwtrbook presentations were wonderful! She really inspired her students! Several NPO initiatives were in the group. The next generation of thought leaders is on its way. I'm not an expert in these things (the book would come in useful!) but this tweet by @twestival doesn't on the face of it look like it is trying to raise money. It is creating an exciting buzz, telling us people around the world are signing up for this and, by the end of a short tweet, I think I want to get involved too! You do such awesome work!!! I would love a signed copy of the book. I just learned about you literally about 2 minutes ago when I read your post on "Listening Literacy for Non-Profits". I work for one that happens to be in the entertainment industry and is looking to find new ways to raise funds for some of our outreach projects. Saw a mention of your book and would really like to read it. I read we're supposed to post a screenshot link of a great tweet, but haven't seen one other than yours!